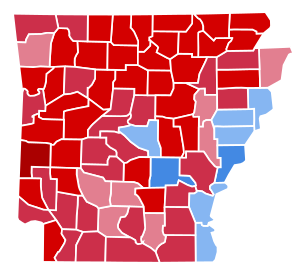 The 2016 United States presidential election in Arkansas was held on November 8, 2016, as part of the 2016 General Election in which all 50 states plus The District of Columbia participated. Arkansas voters chose electors to represent them in the Electoral College via a popular vote pitting the Republican Party's nominee, businessman Donald Trump, and running mate Indiana Governor Mike Pence against Democratic Party nominee, former Secretary of State Hillary Clinton and her running mate, Virginia Senator Tim Kaine. Despite Hillary Clinton having once served as First Lady of Arkansas for 12 years as the wife of former Governor of Arkansas Bill Clinton, Donald Trump won the state with 60.57% of the vote, Hillary Clinton received 33.65% of the vote. 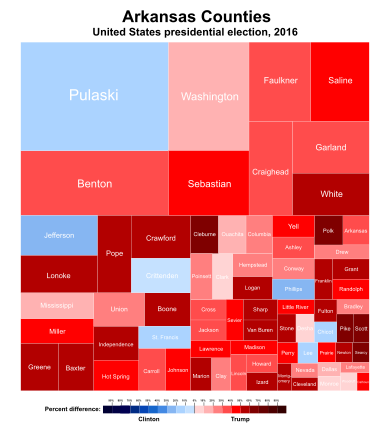 The Republican candidate has carried Arkansas in every election since 2000. This is also the first election that the state has simultaneously voted for a Republican presidential candidate and an incumbent Republican senate candidate. Trump's 60.57% of the vote is tied with Mitt Romney's 60.57% in the 2012 election, making both candidate's performances the best result for the Republican Party in Arkansas since Richard Nixon in 1972, although Trump bested Romney in terms of margin, winning by 26.92% versus Romney's 23.69%. 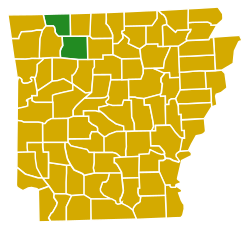 The Prohibition Party candidate, James Hedges, had the notable achievement of finishing third in Arkansas County, ahead of the major third party candidates Gary Johnson and Jill Stein. It was also the only county in the country where he did so. On March 1, 2016, in the presidential primaries, Arkansas voters expressed their preferences for the Democratic, Republican, Green, Libertarian, Constitution, and Prohibition parties' respective nominees for president. Registered members of each party only voted in their party's primary, while voters who were unaffiliated chose any one primary in which to vote. Results of the Democratic primary by county. Bernie Sanders took Newton County. All others went to Hillary Clinton. Republican primary results by county. The following are final 2016 predictions from various organizations for Arkansas as of Election Day. ^ "Arkansas Election Results 2016 – The New York Times". Retrieved November 10, 2016. ^ James Jackson (2015-11-10). "Candidates file for Arkansas primaries - News - The Sun-Times - Heber Springs, AR - Heber Springs, AR". The Sun-Times. Retrieved 2016-01-21. ^ "Washington County, AR : March 1, 2016 Republican Preferential Primary Sample Ballots". Co.washington.ar.us. Retrieved 2016-01-21. ^ "Our final map has Clinton winning with 352 electoral votes. Compare your picks with ours". Los Angeles Times. 2016-11-06. Retrieved 2016-11-13. ^ "Road to 270: CNN's general election map - CNNPolitics.com". Cnn.com. 2016-11-08. Retrieved 2016-11-13. ^ "Larry J. Sabato's Crystal Ball » 2016 President". Centerforpolitics.org. 2016-11-07. Retrieved 2016-11-13. ^ Todd, Chuck. "NBC's Final Battleground Map Shows Clinton With a Significant Lead". NBC News. Retrieved 2016-11-13. ^ "2016 Election Maps - Battle for White House". RealClearPolitics. Retrieved 2016-11-13. ^ "Electoral Scorecard: Map shifts again in Trump's favor, as Clinton holds edge". Fox News. 2016-11-07. Retrieved 2016-11-13. ^ "The Final 15: The Latest Polls in the Swing States That Will Decide the Election". Abcnews.go.com. 2016-11-07. Retrieved 2016-11-13. ^ "2016 General ELection and Nonpartisan Runoff Election Official County Results". Arkansas Secretary of State. ^ "AR - Election Results". Retrieved December 2, 2016.